THEN I repicked up this page and went through a small art crisis. I’ve decided to go back to my “roots” (ha) and try to do the more painty style and stop half assing with the celshading. I don’t like where this comic is headed, especially with the last page, I am getting to complacent. I’m also investing more time in practicing painting/ color choices so I really hope that will be reflected here. One of my weaknesses is strong daylight colors, so the daytime pages have been a struggle. Not to mention everything else like the horses, DAMN THEM. Also the fact that I temporarily forgot how to ink like a smart person, haha. Anyways, I am straight to work on the next page. Part of the problem last month is I’m working on large things that I have no experience with scheduling. Thankfully I paid a lot of attention to what I needed to fix, so I think I can manage to do all 3 of my current workloads with the Meek now without having to lose quality on any of them. (edit: feel free to personally disagree with whatever small changes I’m making, but I’ll put it out there that I’m not really open to discussion about this. This is a personal self-improvement goal I’m working towards, and independent of reader opinion (however lovely it is)). Yay, you’re back! It does indeed look different, I look forward to seeing how the chapter and the style progresses. HOLY CRAP CHECKING THIS SITE AT 2:30 IN THE MORNING ACTUALLY PAID OFF!! Ok, I’m calm now. :’) Anyway, the painting is looking pretty damn good on this page – you can definitely see the extra effort. Not that your pages have ever looked anything but gorgeous. I spent a while just molesting the shading with my eyes- ER, I MEAN, admiring the shading in the last panel. Haha, reminds me of my reaction. Heh. You can almost hear the Old Guy’s head go “thud!” as Alamand drops him. Oh, and I’ve been voting every day, despite the hiatus! Adobart, listen to your CO before you get shot. Jon is uh… yeah he’s a special guy. I admit I can notice some style difference, but that specific word choice seemed really interesting, and being that I know so little about the process of making a comic or developing an art style, I’m super curious. When things get to rote, I start to get worried. Like for the last few page I’ve just been color selecting from past pages, making small adjustments, filling in layers the same way, adding ambient lighting effects the same way, etc. It’s not good to get in a rut, that’s the fastest way to let your quality slide. The style probably looks the same-ish, (the only large difference should be a little more texture on the figures) but I don’t want to get there by following a formula. It’s good to paint by hand instead of relying on tricks in order to keep the level of art high. That makes sense – thanks for the response/explanation. And, more generally – thanks for taking the time to respond to people’s comments/questions, from confusion to critique of style etc. It’s really insightful, and pretty cool to see (not to mention cool of you). Yes, minion, CHARGE into the area presently controlled by an unseen and unknown adversary. Heh. I have to say that the style, although it’s been meandering, hasn’t seemed to worsen over time. So, whatever you’ve been doing hasn’t been *bad*. More detailed commentary will have to wait until my brain grows back. I don’t think it’s getting worse (at least, I hope not), but I have been following some formulas lately that I picked up from freelancing. Formulas are good and necessary for pumping out quantity, but I’d prefer to put quality first (and more time investment, if needed) for my own works. dude, those horses look frickin’ amazing. If they didn’t look quite as good, they would still look really good and most likely nobody would notice. I know it’s hard to tone down the self-criticism, but you are doing an awesome job. Out of all the things on this page, all of which are excellent, I must say I adore Adobart’s expression in the last panel. I hope the Lieutenant sticks around. He seems… awesome. Well, he has a name (Amen) and picture on the “Cast” page, so I imagine he will. Yay! Page! I do the dance of page-joy now! Adobart! Haven’t you watched the movies and tv shows? Don’t you KNOW what happens when the Eager Young Cadet goes charging off towards something of Questionable Safeness? Any bets on how long his shirt stays non-red? Those horses are amazing. After Meek, you should do a spinoff comic just about horses doing horsey things and looking very good doing it. I’ve been following The Meek since the very beginning, and, while your pages are, and will always be amazing, because of the fantastic artist you are, I have noticed a difference. I personally, don’t really like the cell shading you’re doing. Don’t get me wrong, the quality is still spot on, but compared to the beautifully panted pages of the two previous chapters, this chapters colouring has not been as awe-inspiring for me. I’m hoping to one day make a comic myself, that will inspire other people as much as yours has inspired me. I hope you take my opinion into consideration. Actually, Daytime light, especially on a day as clear as the one portrayed, tends to be very ambient and soft, so the shadows would not always be extremely pronounced, or reflective of differences in hue and value. Regardless, she’s not making things to look precisely realistic. She’s working with her own visual language, and it communicates effectively what she means to show. I do not see how you were half assing you cell shading efforts before. If anything this page represents a drop in quality, beg your pardon for the slight as I couldn’t dream of a better project that what you’re working on here. I say that, boldly and ashamedly, based on the level of detail expressed in character expressions particularly the lieutenant who is especially cartoony. Perhaps you intended it that way, but I think that the time crunch that you experienced played a role. There’s nothing to be ashamed with in regards to being busy. I just thing that that’s a good reason to use a few tricks to keep the focus of your efforts where the audience will notice it. Yay, for you being back. Thanks for your opinion :) His face is cartoony because he is a cartoony guy. And if anything, I took my time on this page (it was supposed to go up on Thurs, haha)! I reinked parts of it more than a few times, and ditto for colors… I can understand if you think it’s a drop (that may also be due to it being 4 panels) but I personally don’t agree. Next few pages will continue in this vein until I find my happy place again. I can definitely see the extra attention paid to this page, and I like it. I wouldn’t notice if I wasn’t looking for it, though; all the pages have kept very high quality as you already know. And one can really tell that you at one point spent a lot of time practicing drawing horses! Hey, for someone who doesn’t specialize in horses, you do a damn good job! Better than many who have been drawing them for years too. They’re tricky beasts to draw, and you keep using multiple, strange angles! Thanks! That’s one of the reasons this page took so long, I had to do a lot of preliminary sketches in order to get the final inks to look right. And yes, I’m keeping in mind the different types of movement, as well as how you’re supposed to sit : I don’t have any irl horse experiences, haha, so please correct me if you see some “common sense” mistakes! Haha, his just sounded funny to me XD His first name is Jon though. I do notice the difference in the coloring style. Frankly I like it. Like I said before, it is a good thing that you are striving to improve your technique. 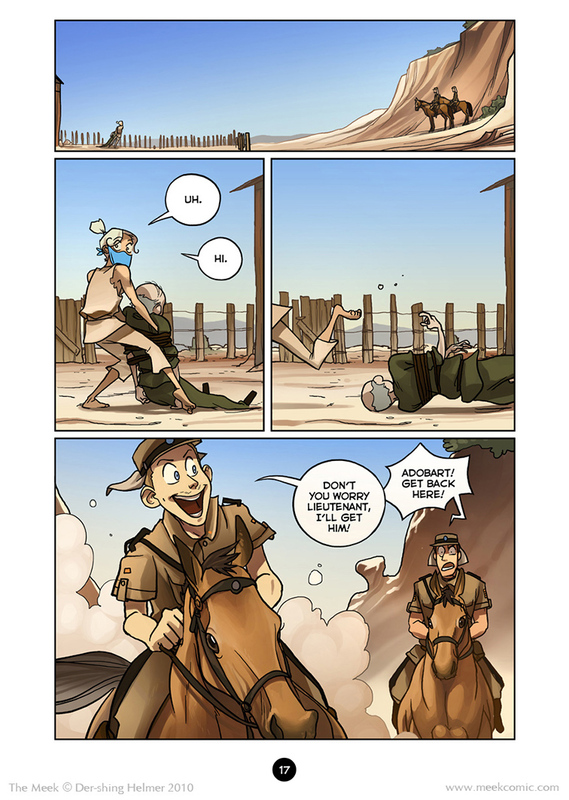 Woot woot, new page! :D Good choice, Alamand, lol. Good luck with all your work and don’t sweat it! How else will you know what works best unless you give it a shot, right? ;) Good luck! I like the painterly approach! I think it gives the pages a little touch of vibrancy. I like how the horse in the foreground turned out. It’s hard to simplify all those lumps and bumps of horse anatomy! If you’re looking for further reference/ideas, try googling “Leonardo Da Vinci horse sketch.” His sketches are pretty linear, and might translate well to your style. Glad to see you back! This comic remains in my top three for art and coloring and I’m nothing but excited to see it get better. All I ask is to keep how you draw eyes the same. You’re able to convey so much with your character’s eyes, like here http://www.meekcomic.com/2010/01/10/2-20/ his expression changes instantly! I love it. Haha, you are in luck. That is the one thing I couldn’t change even if I tried. I noticed that alamand’s mask isn’t shaded. >_> just saying…. That aside, do what you need to with the art and… OMG RUN ALAMAND! Hee hee, I love that line. That offensively stereotypical french chef was one of my favorite characters in The Little Mermaid. In the french version of the film, he spoke like a stereotypical italian. The painterly look has done wonders for the horses! Good job! I hope to god that you don’t cancel this series, the plot is so good and has a lot of potential. Whatever, it looks great. Keep doing whatever it is you’re doing. The comic’s looked great since Day 1 and all the things you’ve done have looked just as good. That you’re suffering over it just proves to us how great it is, so whatever you decide, keep it up! It looks great. First thing that popped into my head when I saw this page was NICE work on the horses! Then I read your comments and had to laff :) Drawing them beasties from the front is hard, all those chest muscles n whatnot. I liked the flow of movement in each panel. You have an intuitive knack for bringing to life all the characters on a page that I really envy. I think the only thing missing from your bright daytime colours is the strong shadows. Wish you luck, whatever path you take with your art. I feel your pain. I’m undergoing an art crisis myself and reissuing some of my early pages in a redux format. That’s the cross to bear as an artist – you’re never ever satisfied with the end product. There’s always something to fix or improve. Hello, I just wanted to let you know that I personally don’t mind the shenanigans, and I especially agree with you about the quality thing. This is your personal project. Not something we the interweb have commissioned. Using your project as a way to advance the quality of your art is in my humble opinion the very best reason to have a personal project. That’s just what I wanted to say about the thing, really. I hate to be a nagger but since I’m already writing: I think Adobarts arm looks really flat in the last panel. Well it’s about time we get to see the main characters’ faces. I am talking about, of course, the horses. You know, I really just want a banner of the first panel, but with either “DERP” or “WELP” or “AWK TIMES” or something of that nature written across it real big. Cuz that’s just what I see. Also I love your comic, just thought I’d say that. Your drawings fill my heart with dark black jealousy. And love. Mostly love. I think. It’s dark in there. I could be wrong. But I think it’s more love than jealousy. Yup. If it’s any consolation, the horses look really awesome. Anyone else hear the Zoidberg woobwoobwoob noise when she ran off? It’s a he. But I think the gender ambiguity is intentional. These guys remind me of Chesterfield and Blutch from “Les Tuniques Bleues” which I didn’t read in French but in Dutch because that’s just how we Dutchies ROLLLLLLLLLLLL!!!! Sigh… Thanks, putting my name on the internet and all. Vosveld. ohmygoodness! an enemy!?! retreat!!! she has a scary mask! Heeee a new page.<3 And shoot, shenanigans are half the reason I read comics like this. Epic storylines, complex characters and pretty settings are awesome, but they aren't much fun without stuff like this. You did a very good job with the horses' muscles and legs, but their faces look funny to me, like they've been squished. I'm afraid I don't have any advice on how to fix that…horse anatomy is one of my frenemies. If the art isn’t perfect, or is cartoony, or unrealistic because of a finger bending in some way, who cares? Honestly, I believe most people SHOULD be here for the story. If one wanted massive criticisms of what is essentially a free product, then one can go to an art gallery. That would be more appropriate, as this is a story, not some sort of painting or mural that happens to have words. No need to comment on the lack of background in a DESERT, how after trying for four hours straight one was unable to bend their finger in the same way as a character, or how an obviously childish cartoony character appears as such. At first I was hesitant to follow what I knew would be a great webcomic because of the way a lot of webcomic readers behave. I was right on the quality of the comic and the behavior. These few really reflect poorly on the quality of the greater webcomic community for someone new to the scene like me. If one wants more than single-panel punchline comics on the internet, perhaps one should treat those who make more with a little bit of respect. I ALWAYS draw my characters that can bend their fingers in ways I can’t. It’s sort of my trademark. I am officially hooked on this comic. I love it. Personally I liked the celshading, but I guess you can do whatever you want because it’s your comic. I’m still obscenely jealous of your talent. Haha, I didn’t mash those two words together (though that is funny). But yeah his name is Jon Adobart.